We were lucky to have a sneak peek at this jaw dropping exhibition and it’s très impressive! Even if you don’t see inside the huge white box display space, the building is a piece of art in itself. This is the first sketch of the building! 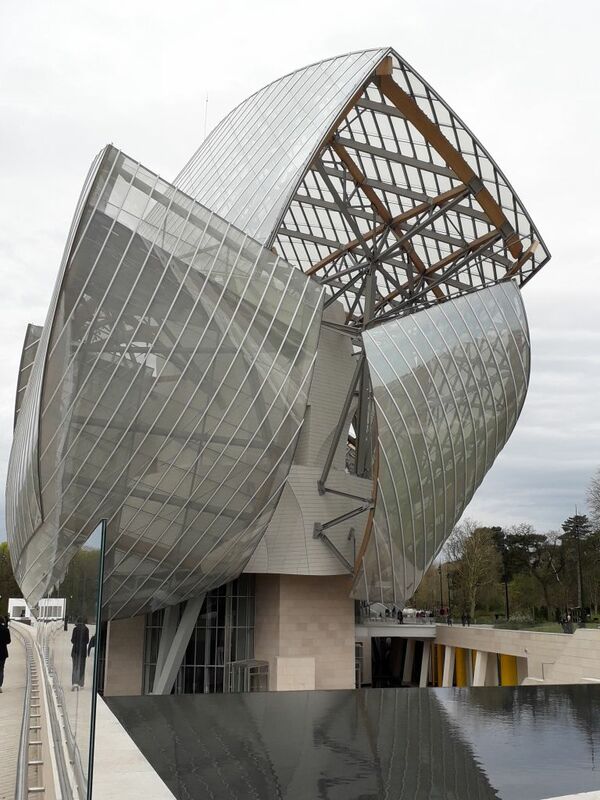 Architect Frank Gehry drew the outline shape on a paper napkin in flight on his way to meet Bernard Arnault, CEO of LVMH who’d asked him to come up with an extraordinary space for art and culture in an iconic building for the 21st century. And wow did he get that right. It took ten year’s from the idea to the opening in the leafy upmarket Parisian district on the edge of the Bois de Boulogne. Frank Gehry’s box within an iceberg under sails – spectacular building! There is a Christ-like beaten silver LV logo at the front of the building and a few luggage trunks sticking out of the walls – but these are the only clues as to how the massive amount of money was made to put this building together. There are no scarves nor handbags in the gift shop – so don’t come expecting to pick up a Louis clutch. 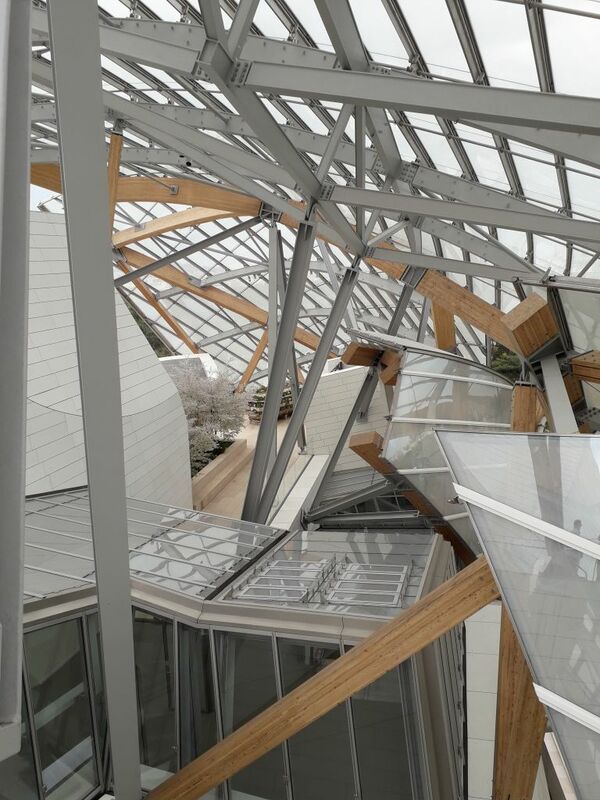 The Fondation Louis Vuitton launched the new exhibition “In Tune with the World” (Au Diapason Du Monde), a new selection of artists from the Gallery’s Collection and of several different mediums. The exhibition, open until 27th August, unites modern and contemporary works, most of which have never before been exhibited in the Frank Gehry’s building or even in Paris. 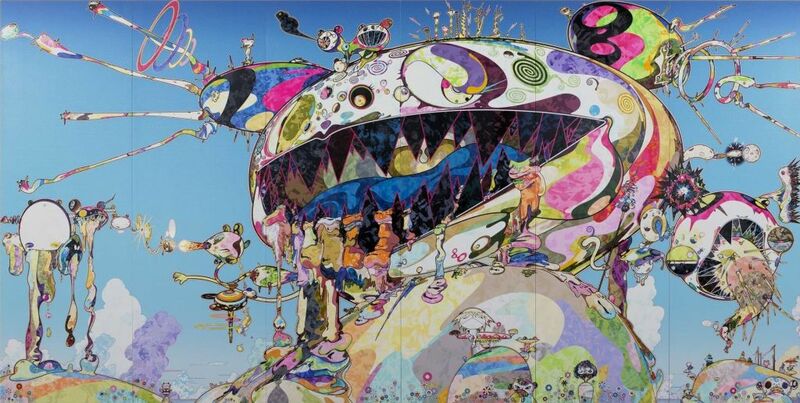 Notable features include Takashi Murakami’s monumental fresco The Octopus eats its own leg, displayed in Paris for the first time, and Pierre Huyghe’s Untitled (Human Mask), never before exhibited in France. Sequence A: an immersion in the world of Japanese artist Takashi Murakami, an artist who combines the Kawaii aesthetics with classical and experimental techniques to depict Japan’s political, cultural and social history and traumas, such as the atomic bomb or, more recently, the tsunami. Sequence B: Titled ‘Man in the living universe’, this sequence is themed around the idea of emotional affinity and extends over the other three floors of the building and the outside Grotto area. 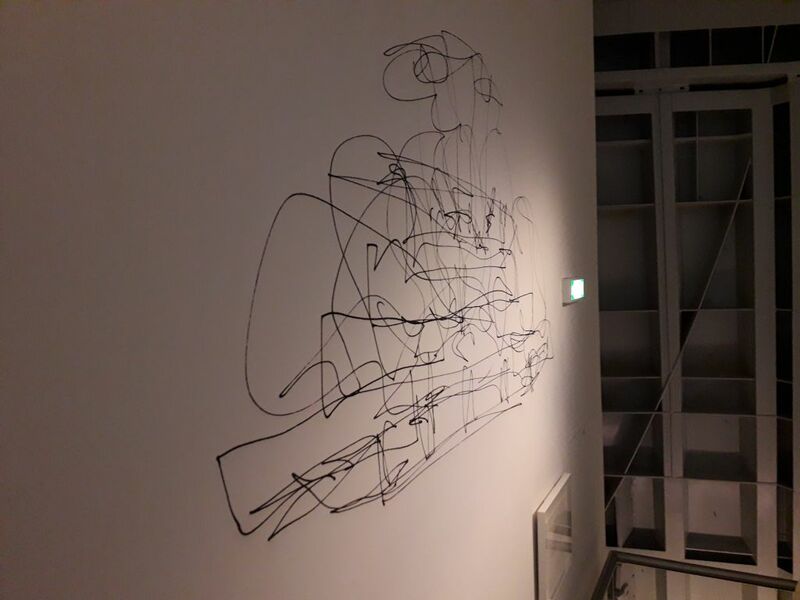 Three complimentary sequences (‘Irradiances’, ‘Here, infinitely…’ and ‘The man who capsizes’) display artworks by 28 French and international artists including Matisse, Flavin, Giacometti, Huyghe, Gaillard and Villar Rojas. As I say, we got a look as one the huge doors to the gallery was being held open for a curator and it’s a huge canvas that brightens up the massive white space. Even if you only have the tour of the building – think visiting the Titanic to see how it was built, it’s worth the trip out of central Paris.